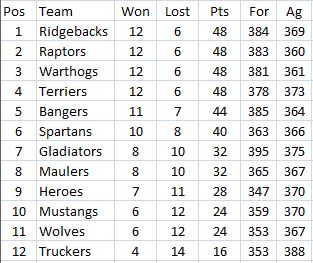 Congrats go to the Ridgebacks who are the minor premiers by one point! and i didnt even buy the prospectus!!!!!!! Megabonus wrote: and i didnt even buy the prospectus!!!!!!! I can visualise you saying this with a cigar in one hand and a drink of whiskey in the other. your arguement would have merit if i didnt have a differential of +23!!! I'd be embarrassed to pose with a fish that small! Congrats on top spot Macca, you deserve it. This game is very cruel though, 2 weeks ago I had avg 395 for 6 weeks and this week I cant get above 300! Its a bitter pill to swallow. It will be 1 and done for the Spartans this year, Gladdies will kill me! The finals are a funny animal, Jase. Croz has been decimated with Barlow, now Fev out. Could be a cracker game!